Marquee weddings, tipi celebrations and other blank canvas venues are such great options for couples wanting to create a truly personalised day! With the ability to build your dream wedding from the ground up, we are loving this recent shift towards DIY receptions. There are so many benefits to styling and planning your own wedding reception without restrictions... but it does mean some extra organisation when it comes to creating your hire list! It’s important to ensure every element has been considered, to avoid any last minute stress. With hundreds of beautiful weddings now under our belt, we thought we’d run through ALL of the essential items to hire for a DIY sit-down reception. Keep reading for our comprehensive wedding reception hire checklist, along with some helpful planning tips to get you started! Wedding Reception Hire: Tables and Chairs! The most obvious (and important) items on your hire list for a sit-down reception will of course be dining tables and dining chairs! Your tables and chairs will help to set the tone for the rest of your styling, so it’s important to choose a combination that works with your overall wedding vision. You’ll also want to consider practical details, such as your menu style and the space available at your venue. Our timber feasting tables are perfect for a shared menu (being slightly wider), or our long wooden dining tables can work best for a la carte dining or smaller spaces. We recommend working out your ideal floor plan first, to help you work out how many tables will be required. You can check out our table layout tips on the blog to assist with this in-depth, or read more about how to choose the perfect chair for your wedding reception. Catering and tableware are the next essential items for a sit-down reception. This is where many couples run into confusion, and often overlook the smaller details like dessert spoons or napkins - you'd be surprised how much catering equipment we book out at the last minute! Catering equipment doesn’t have to be boring - we LOVE using tableware to make a statement with wedding styling! Details like coloured linen napkins, gold cutlery or crystal glassware can really help to transform your tablescape. It’s also important to ensure you book the right quantities to cover your guest numbers. We have a 10% policy in place to allow you to reduce your numbers closer to the date when your RSVPs are confirmed - it’s always better to be safe than sorry. Now that the practical items have been taken care of, you can start to tick the decorative items off your list. These are the items that will help to tie your styling together and create a beautiful cohesive look! You might not have these smaller details finalised during the early stages of your wedding planning, but you can always add to your order as your plans come together. Our 12-month wedding hire timeline is a great reference for this, with our recommendations on when to hire each element for your day! Planning and styling your own sit-down wedding reception from scratch can seem challenging at first, but there’s nothing more rewarding than watching it all come together! Whether you’re planning a marquee wedding or a relaxed Tipi celebration, a blank canvas wedding is the perfect way to put your own personal stamp on your styling. You can browse our entire furniture and decor hire range online, or get in touch with our team for a copy of our hire catalogue. 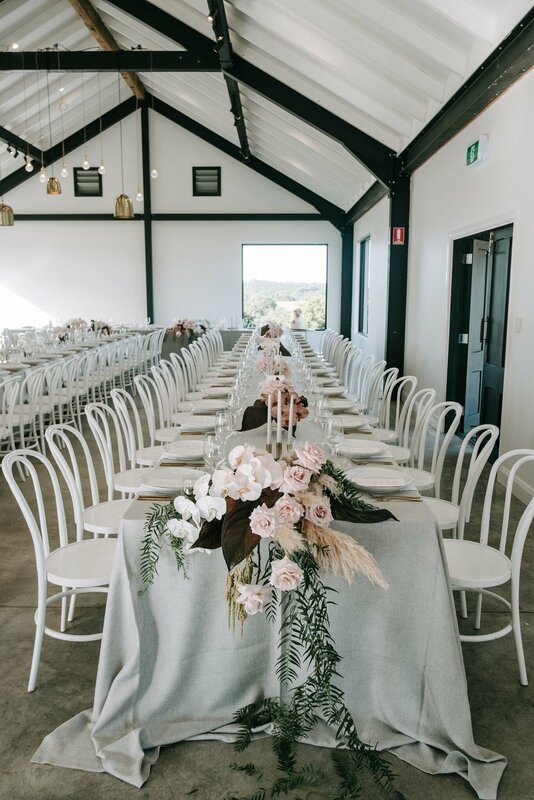 Working on countless weddings on the Gold Coast, Brisbane, Byron Bay and beyond, we love helping couples with our furniture hire solutions and can offer our expert advice to make the process as easy as possible! Planning a cocktail wedding instead? Check out our top tips for cocktail furniture hire on the blog. 10 of our Favourite Wedding and Event Venues in Brisbane!